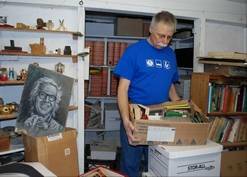 Waukegan Public Library Executive Director Richard Lee in Ray Bradbury’s basement with a box of foreign editions. Ray Bradbury’s personal book collection has been inherited by the Waukegan Public Library, located in the town where he was born and spent much of his childhood. As you would imagine, knowing Bradbury’s love of books, he owned a lot of them. “Every room had a bookshelf overflowing,” said Rena Morrow, the library’s marketing, programming, and exhibits manager. The books on those shelves included first editions, Bradbury’s work in foreign languages, and autographed copies. The library would like to get one of Bradbury typewriters, too. Staffers hope to create a permanent exhibit in honor of the author. There are also prospects for a trade between the library and the Center for Ray Bradbury Studies at Indiana University, which is interested in getting some of the books. A trade to broaden the library’s collection has the blessing of Bradbury’s daughters, says its director. Meantime, Waukegan may add to to the author’s local honors by naming a school for Bradbury. He is already recognized with a star in the city’s Sheridan Road Walk of Fame, and by Ray Bradbury Park, dedicated in 1990. The District 60 Board of Education fielded a formal request on Tuesday, June 11, from a group of residents that included Karen Bales, a retired Waukegan educator who was principal at Whittier from 2006 to 2010. District spokesman Nicholas Alajakis said the request is under review by Superintendent Dr. Donaldo Batiste, who will follow district policy in considering the change. There is ample precedent: the district has approved name-changes for three other schools over the past 20 years, memorializing several local educators. Once the city even named a school after a living person. Waukegan native Benjamin Kubelsky, who gained fame as Jack Benny, flew in from Hollywood in 1961 to dedicate Jack Benny Junior High.